Oh, my goodness! Did you see that great calendar Dawn made? I'm going to have to steal this idea use this as inspiration to get my housekeeping and daily tasks organized. Father Richard Powers, passed away on December 7, 2007. He was Ben's great uncle, a priest who officiated at many of our greatest life events. Here he is baptizing Pumpkin. Poor Ben tried mightily to attend his funeral. He was slated to fly out on a flight very early on that Monday, the 10th. It was canceled as were the four subsequent flights he was booked on. He never made it. I hear the funeral was beautiful with 30 priests in attendance including the retired auxiliary bishop of the Boston diocese. As the mourners left the church, the priests were standing on the steps singing one of Uncle Richard's favorite Latin hymns. I feel badly that this post is so late. Please forgive me, Uncle Richard. Eternal rest grant unto him, O Lord, and let perpetual light shine upon him. May his soul and the souls of the faithful departed, through the mercy of God, rest in peace. Amen. Last night we attended the 5:00pm children's mass. It was a lovely, lovely service. 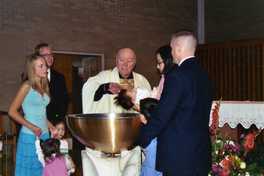 At one point, Father Richard has the children of deployed parents come up for a blessing to send on to their loved one. It was poignant. My heart ached for them and I had to blink away the tears. The children sang "Silent Night" and then were blessed. Please pray for all separated from their family today especially those in the military including spouses and children. God bless you all on this joyous day. Luckily, for us, we school year round and it balances out in the end. 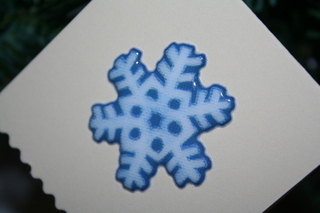 We've been using Catholic Mosaic, Christmas Mosaic, along with Elizabeth's Tomie dePaola unit. Our homeschool group has an activity each Friday from Elizabeth's unit. The above is a good list of things I want to blog about. Oh, and there's also our tree. I guess I should talk about the ER trip a bit. Pumpkin has pneumonia and an ear infection. That's the fastest we've been through the ER. That's my Grinch name. Ben's is Stingywhiner Selfishshorts. I put in everyone elses and here are theirs: Brother--Frownyscrooge, Sister--Grimtroll, Honey--Crotchetycrab, and Pumpkin--Scroogeygloom. Margaret needs your prayers. Please storm heaven for her and her wee one. My husband's great uncle, Richard, has been asleep for the past 24 hours. He's not yet slipped into a coma, but Ben's Aunt Vivian feels the end is near. Please pray for a peaceful death for this wonderful Jesuit priest who I know has touched many lives. I'm not a very political person. I follow what I can, but politics bore me. I try to keep up with the issues that mean the most to me (i.e. pro-life issues), but otherwise, I rely on blogs, my husband, and sister to keep me informed of others. I know, I know, it's not really being a responsible voter. This coming election has me quite worried. So, I'm jumping in to join this group and pray a decade each day for the elections. We need to start now. This country is headed in a direction that worries me. So, won't you join in? Jennie from Far Beyond Pearls links to these sad, sad articles. Heartbreaking. 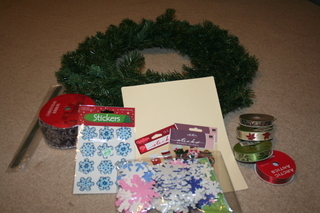 I had purchased a wreath for Advent. 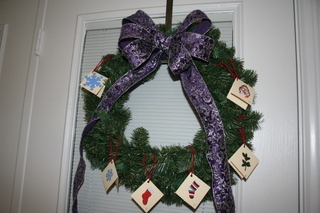 The plan was to have a simple purple bow for Advent. After seeing Dawn's wonderful idea, I knew I had to expand on my simple wreath. I'm not too happy with the bow, but it'll do. I wish I could make those wonderful full bows. I think I needed to add one more loop on each side to accomplish the look I was going for. I plan on changing the bow for a blue one on the Feast of the Immaculate Conception. I searched high and low for a rose colored ribbon for Gaudete Sunday, but haven't located one yet. 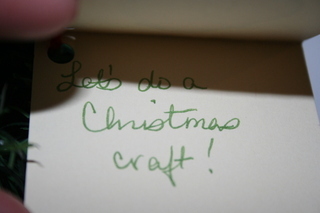 When I was putting the different activities on each notecard, I forgot that Thursday was the Feast of St. Nicholas. I may change that day's activities or add to it. Our activities are simple but I know the children will love them. Tomorrow our activity is to get the tree. We go to a wonderful farm where we could cut our own, but those trees are not great. We will, instead, purchase a Douglas fir. This particular farm has the best ones I've seen here in Texas.